Our Play-A-Round™ Golf takes Mini Golf to the next level. 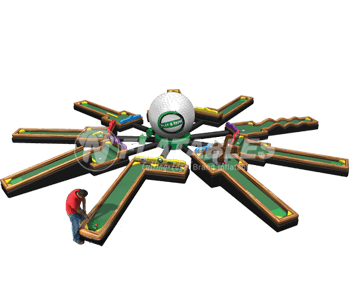 This Inflatable Miniature 9 Hole Golf Course features 9 holes with varying designs and levels of difficulty. A Motorized Windmill, Drops, Hills & FUN Challenges! Players walk around the putting surface for easy access. The Inflatable Mini Golf 9 Hole Game is perfect for birthday parties, school events, church festivals, corporate events, carnivals and any FUN event!